It is now four years ago since Prof Colmer and I initiated the fruitful and exciting collaboration with Nagoya University in Japan. This is the most comprehensive and complete study that I have ever been involved in and I am extremely proud that the manuscript is now ready for the critical eyes of the editor of PNAS and hopefully also the referees. We have discovered a new gene Leaf Gas Films 1 (LGF1) that controls the cuticle hydrophobicity in rice and therefore also the formation of leaf gas films during flooding. 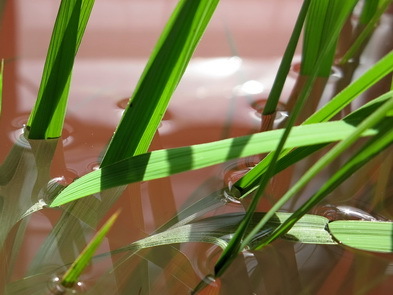 Superhydrophobic leaves in deepwater rice. The leaf gas films are visible as silvery sheen under water. Today I am going to celebrate that the manuscript is now submitted to the prestigious PNAS. The paper reports the discovery of just one single gene that seems to control leaf hydrophobicity in rice - and thus also formation of gas films during flooding!